Alicia Cooke speaks against the power plant at Monday's public hearing. Frustration over flooding from thunderstorms and anxiety from hurricane warnings are playing a major role in the debate over building a new power plant in eastern New Orleans. The problem with Entergy’s proposal, according to opponents, is that the new plant won’t help the city rebound after a disaster or reduce frequent power outages. They say the city needs to shore up its electricity transmission and distribution system rather than increase supply. And although power shortages contributed to the pumping problems, most of the Sewerage and Water Board’s pumps are not powered by Entergy. 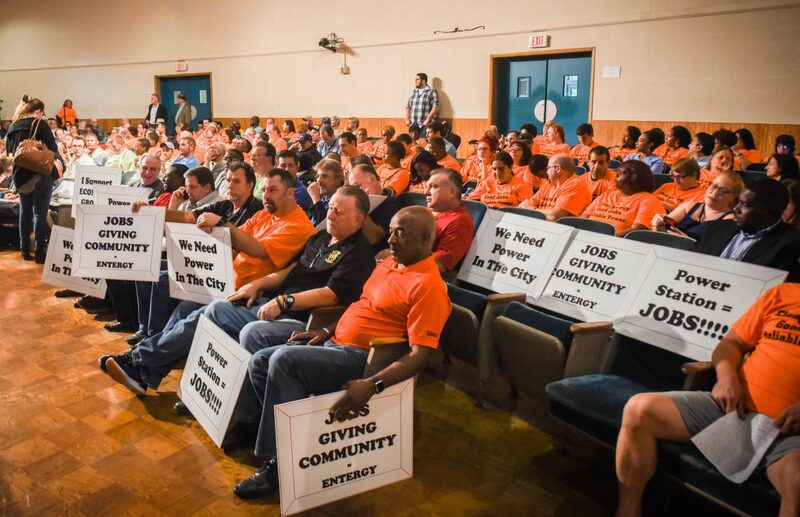 Entergy New Orleans has asked the city council, which regulates the power company, for permission to build a new natural gas power plant at its Michoud site in eastern New Orleans. Two power plants were decommissioned there in June 2016. Entergy first applied for a new plant that June, but withdrew the application. This summer it submitted a second application with two big changes. It offers two choices for the plant: the 226 megawatt, $232 million plant originally proposed and a smaller, 128 megawatt, $210 million facility. Entergy favors the larger one. And in the new application Entergy emphasizes a different rationale for the new plant. It originally claimed it needs the plant to meet future electricity demand. But last summer, the company released lower estimates for how much New Orleans’ energy needs will grow in the coming years. Entergy’s customers in New Orleans would foot the bill to build, operate and maintain the new plant. The company also can collect an 11 percent return on equity, which means customers would pay another $25 million if the company built the larger plant. Either plant would be a “peaking” facility, meaning it would be used on rare occasions when electricity demand is extremely high, normally during the hottest days of summer. People crowded into the city council chambers Monday night for the only scheduled public hearing on Entergy’s application. The room quickly reached capacity. Twice during the next two hours, the moderator asked some people to leave so those waiting outside could participate. “I think we’ve got them outnumbered,” chuckled Charles Rice Jr., president and CEO of Entergy New Orleans, before the hearing started. The audience was a sea of fluorescent orange shirts. They read “Clean Energy. Good Jobs. Reliable Power” on the front and “Support New Orleans Power Station” on the back. Two men named Gary and Daniel (they wouldn’t provide their last names) passed out the shirts, which they said they had ordered online. They said they were part of a group called “Council for Responsible Governance,” which they formed less than a month ago. Daniel said they used “secret Facebook groups” to encourage people to come and show their support for the plant. The two spoke in dire terms. “If there’s another emergency and this power plant isn’t built, there’s a good chance we won’t survive it,” Gary said. They may have been the biggest doomsdayers in City Hall that evening, but others shared their anxiety. Several of the power plant’s supporters said they were spurred to attend the hearing by mismanagement at Sewage and Water Board this summer and the revelation that there are major holes in the city’s drainage system. But the power plant’s critics said those who want the city’s drainage pumps to be fixed are spending their political energy on the wrong issue. Entergy cannot provide power to the majority of the city’s pumps because they use an antiquated form of electricity. The power plant’s supporters and detractors did agree on one thing: New Orleans needs a more reliable, resilient power system. Where they disagreed is whether the plant will achieve that. In an energy system, reliability refers to day-to-day dependability. Resilience refers to its ability to return to normal after a major disruption like a hurricane. 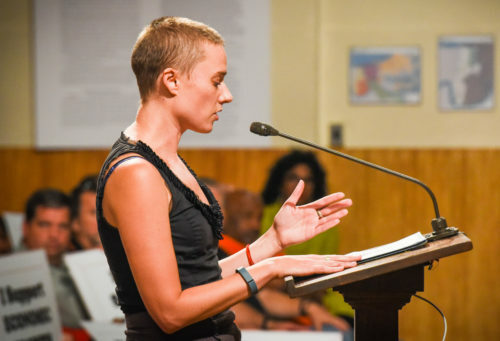 Alicia Cooke speaks against the power plant at Monday’s public hearing. Supporters of the power plant said Monday night it would help both, reducing the number of everyday blackouts and securing the city’s power in case a disaster cut New Orleans off from its power plants beyond the city limits. The plant “will provide a reliable local source of power generation in Orleans Parish to help stabilize the grid and keep the lights on,” Rice wrote in a column published on NOLA.com/The Times-Picayune on Sunday. But according to a written statement from the Alliance for Affordable Energy, the Deep South Center for Environmental Justice, 350 Louisiana and the Sierra Club, Rice’s assertion is misguided. Using data provided by Entergy, the group found that about 98 percent of outages between 2011 and 2016 were due to failures in the distribution system. The other 2 percent were caused by transmission issues. None of the outages was related to energy generation. There were about 2,600 power outages in New Orleans in 2016, according to the Alliance for Affordable Energy, which it says is high for a city of this size. “A new power plant would do nothing to stop the power outages that have been happening and the major repairs to their neglected distribution grid would still be needed,” the group wrote in a recent report. Opponents want Entergy to spend $57.3 million on transmission upgrades that would “mitigate all reliability-based system constraints over the next ten years” at a fraction of the cost of a new plant. The power plant’s supporters also argued that a new plant within the city limits would help New Orleans withstand hurricanes and floods. They fear a bad storm could “island” the city by taking out the transmission lines that bring most of the its power from outside plants. But according to Forest Bradley-Wright, senior policy director for the Alliance for Affordable Energy, the new plant would be of little help in the vast majority of disasters. Although supporters say the plant could act as a backup if all transmission lines leading into the city were blown down, Bradley-Wright said that’s never happened before. Even if it did, he said, the larger plant preferred by Entergy would most likely be of no use because it wouldn’t be able to start independently from the power grid. But neither would the smaller plant be of much help, he said, because a storm strong enough to take down major transmission lines most certainly would wreak havoc on the power lines carrying electricity throughout the city, which he said are more vulnerable than the transmission lines. The report from the Alliance for Affordable Energy says the proposed site of the new power plant is in a low-lying area vulnerable to flooding. During Hurricane Katrina, water rose six feet at the old Michoud facility, causing more than $17 million in damages. It was offline for six months. If a hurricane caused widespread flooding, Bradley-Wright said, the new plant probably would be forced to go offline. The city council chambers was packed for the public hearing, but the dais was not. Only one councilmember, Susan Guidry, was present for the entire hearing. LaToya Cantrell and Jason Williams left early. Jobs were the next biggest talking point. Many residents of eastern New Orleans said their neighborhood needs an economic boost. Opponents were quick to point out that the plant would result in only 12 permanent jobs. Representatives from the solar energy industry showed up to argue more jobs would be created by investing in renewable energy than building a natural gas plant. Speakers also brought up a slew of environmental concerns. Some pointed to a study that suggests groundwater pumping from the old Michoud plants accelerated subsidence in the area. Proponents of the new plant shrugged off that criticism, saying the new power plant would use less groundwater than the old one and pointing to the conflicting findings in a study published by Entergy. Broader environmental concerns were raised as well, with some speakers warning that continued burning of carbon fuels will contribute to sea level rise that endangers New Orleans. Others said the plant would cause pollution in a part of the city mostly occupied by African-Americans and Vietnamese. Most of the speakers, however, spoke in favor of the plant. And some of their reasons had nothing to do with jobs, power reliability or environmental concerns. They said Entergy was a good corporate citizen. Representatives from at least 12 organizations that receive funding from Entergy went to the microphone to talk about the company’s trustworthiness and community connections. The public comment period for the application will last through January. The earliest the city council would consider the application is February, after the current round of elections but before new officeholders are sworn in.